After a decade of silence...the buzz is back! US cult horror sequel directed by Tobe Hooper. This time around, the action focuses on Texas Ranger Lofty Enright (Dennis Hopper), a man obsessed with finding the deranged murderers of his brother's kids. 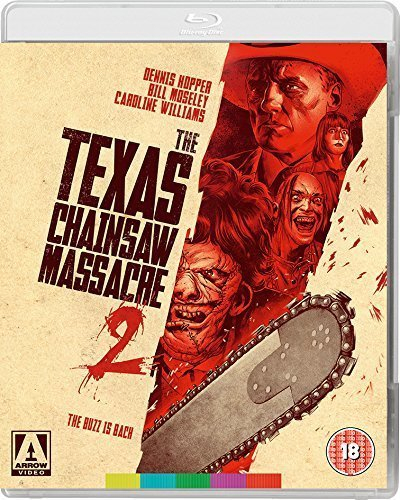 When he hears that DJ Vantia Block (Caroline Williams) has a recording of a chainsaw attack made when Leatherface (Bill Johnson) and his pals descended upon a caller during a radio phone-in, he tries to persuade her to use the recording to lure the killers out into the open. She agrees, but neither DJ nor Ranger are quite prepared for the madness they are about to encounter. It Runs in the Family: a six-part documentary looking at the genesis, making-of and enduring appeal of Hooper's film, with interviews including star Bill Johnson, co-writer L.M. Kit Carson, Richard Kooris, Bill Moseley, Caroline Williams, Tom Savini, production designer Cary White and more!